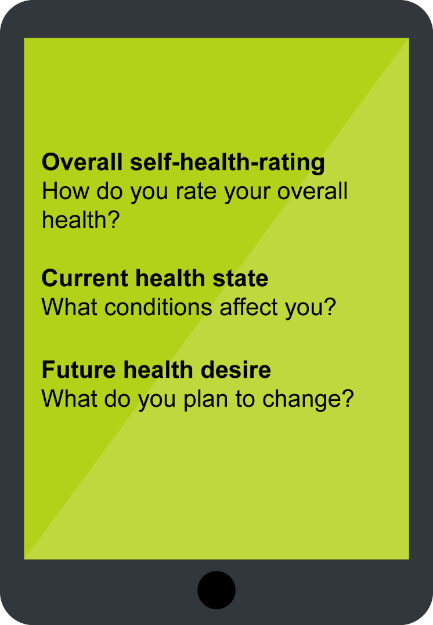 the same framework to ask participants about their personal health desires – essentially the behaviours or conditions they would like to change. The snapshot was designed in this three-part format by Clever Together as this is an approach used to mine data for signals and patterns that can help cluster people into definable groups. It enables analysts to explore differentials between responses. For example, one would expect, the tally of unhealthy behaviours and conditions to be lower (i.e., a better personal health state), on average, for people who report they are generally healthy, as would their desire, on average, to change their behaviour. However, this wasn’t the case, as we’ll explain shortly. share any radical ideas they may have for helping people to take charge of their own health. What radical ideas do you have or have you seen that can help people or communities to take charge of their own physical and mental health? 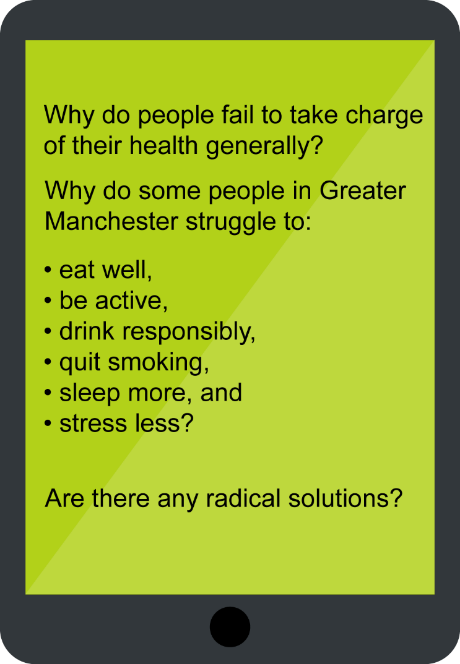 Why do so many people in Greater Manchester fail to take charge of their own health generally? Why is it that some people in Greater Manchester struggle to eat well (e.g., over or under eating, not eating enough food and veg)? Why is it that some people in Greater Manchester struggle to be active (e.g. being physically active for more than 2 hours a week)? Why is it that some people in Greater Manchester struggle to drink responsibly (e.g. keeping under 14 units of alcohol a week – the equivalent to 6 pints of beer, 6 glasses of wine)? Why is it that some people in Greater Manchester struggle to quit smoking? Why is it that some people in Greater Manchester struggle to regularly get enough sleep? Why is it that some people in Greater Manchester struggle to reduce their stress levels? Between 15th February and 31st March, 3,737 people joined the public online workshop, 20% of which became “most active” participants, sharing 4,537 ideas comments and votes across the 8 challenge questions. We’ve been asked “is this digital approach better suited to younger people?”. The data showed this was not the case. While 31% of the people who completed the snapshot were under 35, only 15% of those who were the most active in the online discussion were under 35. Conversely, 55% of the active online workshop participants were aged 45 to 79, whereas only 33% fell into this age range in the snapshot survey. It would seem our methods empowered older people, despite the concerns of some. Click here to read about our findings.